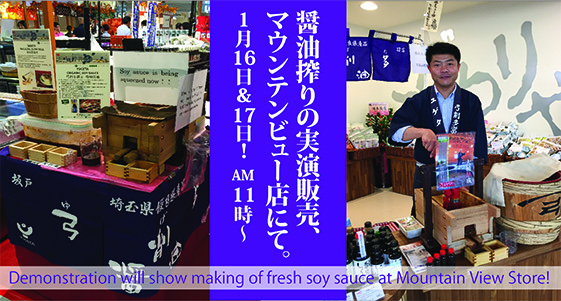 Fresh soy sauce demonstration sale at Mountain View Store! 11:00 a.m. ～ 6:00 p.m.
We will be having a freshly squeezed soy sauce demonstration. You will be able to see how soy sauce is made. We will have tofu for sampling with the soy sauce. In addition, when you purchase soy sauce product, you will get 50 ml of fresh soy sauce for free! Nijiya Mountain View Store started updating its local news on Facebook!